I received quite a few emails asking what I used for the open ended questions. So I thought I would post what I used and what I encountered. First I actually used the CCNP Bootcamp material from INE. I did not watch all the videos. I just didn’t have the time left to do this. I did print out all the slides and read through them a few times. 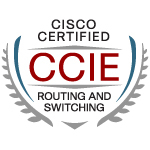 Along with that I used Anthony Sequeira’s CCIE written quick sheets as well. That was pretty much everything I used specifically for them. Now with saying that the questions I encountered only one was a CCNP level question. I would consider the other ones barely CCNA level. Again maybe I got lucky last time? Not sure, but the question were easily answered just by my actually study for the lab exam itself. For the next attempt I am planning more of the same and using the new written guide as well. Even though I didn’t pass on this attempt there are a couple people who I want to thank for doing a lot to try to get me my number. First I need to thank Mike Down over @ IPexpert for all he did for me. Second I need to thank Kady Heaton over @ Internetwork Expert for handling all my material over there. If you are looking at either vendor they are who I would recommend getting in contact with! That is what Narbik will tell you, and he is right. Looking back at yesterday, that lab was so passable. It was in my head the whole time that it is some unclimbable Everest. It’s not, by far. The lab is fair, but very passable. You just need to be prepared. The open ended questions, were a joke for the ones I got. If you have studied I can’t see any issues with them. I was done with them in five minutes. Nothing I haven’t seen before. Maybe I got lucky? Maybe I blew my lottery win? Maybe they changed them up? Doesn’t matter – I won’t let them phase me for my next attempt. My weak points in QOS killed me. A big fat zero for that section. Got 100% in the OEQ’s though :P! Oh well it is late and I need to get some sleep, just got in from the airport. Need to formulate a new plan and lab date. Good luck to the people I know taking it this week! Don’t sweat the OEQ’s! I will toss up a write about it all within the next few days.